Radio-controlled or remote-controlled toys, popularly called RC toys, are self-powered and can be controlled from a distance using a remote that works with radio waves. 1. When we push the control, the transmitter sends a specific number of electrical pulses corresponding to that action through the air. The transmitter has its own power source, usually in the form of a 9-volt battery. Without the battery, the transmitter will not be able to send the radiowaves to the receiver. 2. Once the RC toy receives the radio waves, the motors kick into life to cause a specific action to occur. The power source sends power to all working parts, including the motor. The transmitter enables control through radio waves and the receiver activates the motors. When we press a button on the transmitter to make the RC toy go forward or backward, a pair of electrical contacts touch. Receiver identifies signals, sends it to circuit. Transmitter: The remote control contains a radio transmitter which operates on a particular frequency that the receiver is designed to receive. Receiver: The receiver is fixed within the car and constantly receives signals from the transmitter. When a transmission is identified, it translates the number of electrical pulses into action. 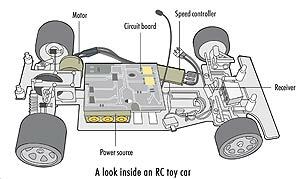 Power source: All remote control cars require a power source. Rechargeable batteries power small electric motors. Alternatively, some use small internal combustion engines. Motor and Circuit Board: The motor is responsible for the turning motions of the toy while the circuit board works like a pool through which all commands go on to specific parts.